Alsop Architects (Robbie/Young+Wright Architects - local architects) 2004. 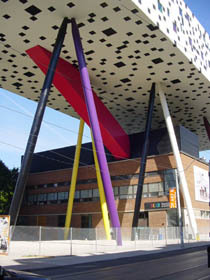 The Sharp Centre for Design was built to accommodate an expansion of the Ontario College of Art & Design in downtown Toronto. The project was funded by the College, the Province of Ontario, and Rosalie and Isadore Sharp - the benefactors after whom the building is named. The building houses new art studios, lecture theaters, exhibit spaces, and faculty offices. 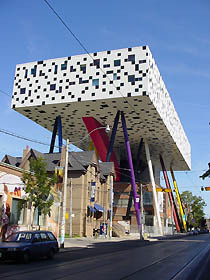 It is the first building completed in North America by the English architect Will Alsop. 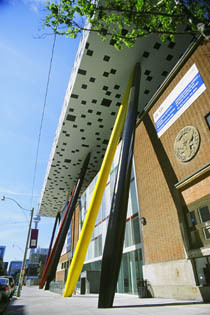 The center is a two-story, black and white rectangular volume set atop brightly colored, 26 meter tall columns, straddling existing buildings of the College. In addition to this most visible part of the building, an unbuilt space between existing buildings was filled, creating space for new functions while providing the elevator and stair core that services the upper levels. 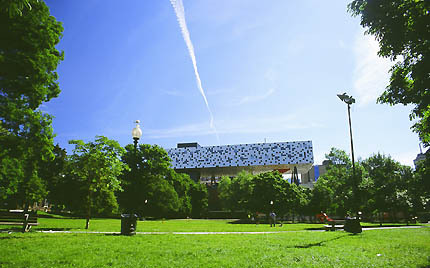 Located on a quiet side street between two main commercial streets, its immediate neighbors include midrise housing, a food court, the Art Gallery of Ontario, the Gardiner Museum of Ceramic Art (temporary location), and Grange Park, a treed community park immediately south of the Art Gallery of Ontario. From Grange Park the black and white volume creates a delightful edge as it hovers on its stilts. 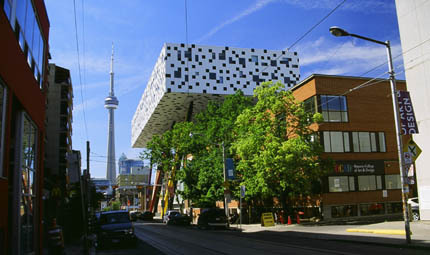 With the addition of the Sharp Centre for Design at the Ontario College of Art and Design, Will Alsop cleverly addresses the complicated notion of expansion in a dense urban setting with his soaring black and white box. The building stitches a connection between existing buildings while providing new space in the rectangular volume that proudly soars above. Organizing the rectangular block above the site allows the street level to become what promises to be a new and valuable civic space that can become an extension of the activities of the college. Still the building may be criticized for being somewhat exclusive, failing to offer a serious connection to the street. However regardless of this consideration one cannot help but believe that there is room in Toronto for this type of assertive expression. Provocative, unconventional, hopeful, whimsical, and perhaps irreverent, the building is remarkable in the context of Toronto. As a winner of a 2004 RIBA Worldwide Award, the building was described as "courageous, bold and just a little insane." Alsop's project seems perfectly fitting for a college of art and design in a city criticized for competent, but ordinary, architecture. Interestingly, what we see is far less wild than the scheme originally envisaged by Alsop - early representations show the rectangular volume dressed in a dizzying array of day-glow colors. In this light, the simple pre-finished metal cladding seems somehow consequential, and perhaps a hint to difficulties involved in achieving such an unconventional building. Above all, the building may be considered optimistic, and hopefully sets a course for the students who will occupy it. The city block upon which the Sharp Centre sits is also home to the Art Gallery of Ontario, set to be 'transformed' in the near future by an expansion designed by Frank Gehry. 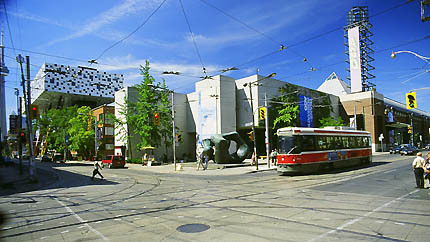 The Sharp Centre for Design is located on McCaul Street, just south of Dundas Street, and north of Queen Street. It stands approximately one kilometer straight north of the CN Tower. By Subway: Take the University Line Subway to St.Patrick Station. Walk west on Dundas Street to McCaul. By Street Car (called 'the TTC' in Toronto): Take the Dundas Street Car to McCaul Street and walk south on McCaul; or, take the Queen Street Car to McCaul Street and walk north on McCaul. The upper levels of the building are not generally open to the public, but the lower parts are accessible. 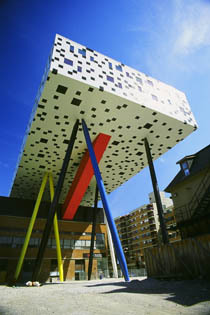 For further information please visit the Ontario College's web site at www.ocad.ca or call +1 416 977 6000. You can visit Alsop Architects' web site at www.alsoparchitects.com, though it may take you some time to find what you are looking for there.